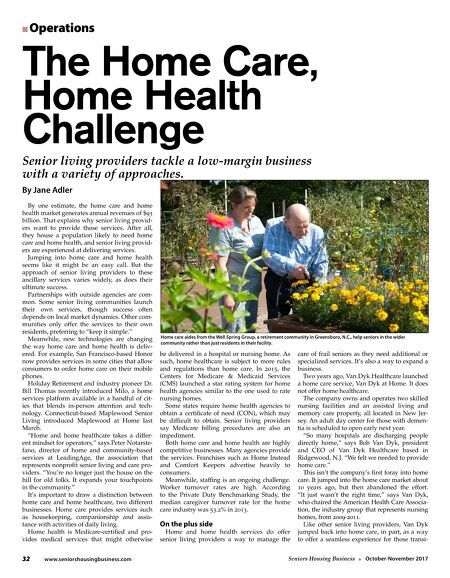 32 www.seniorshousingbusiness.com Seniors Housing Business n October-November 2017 By Jane Adler By one estimate, the home care and home health market generates annual revenues of $93 billion. That explains why senior living provid- ers want to provide those services. After all, they house a population likely to need home care and home health, and senior living provid- ers are experienced at delivering services. Jumping into home care and home health seems like it might be an easy call. But the approach of senior living providers to these ancillary services varies widely, as does their ultimate success. Partnerships with outside agencies are com- mon. Some senior living communities launch their own services, though success often depends on local market dynamics. Other com- munities only offer the services to their own residents, preferring to "keep it simple." Meanwhile, new technologies are changing the way home care and home health is deliv- ered. For example, San Francisco-based Honor now provides services in some cities that allow consumers to order home care on their mobile phones. Holiday Retirement and industry pioneer Dr. Bill Thomas recently introduced Milo, a home services platform available in a handful of cit- ies that blends in-person attention and tech- nology. Connecticut-based Maplewood Senior Living introduced Maplewood at Home last March. "Home and home healthcare takes a differ- ent mindset for operators," says Peter Notarste- fano, director of home and community-based services at LeadingAge, the association that represents nonprofit senior living and care pro- viders. "You're no longer just the house on the hill for old folks. It expands your touchpoints in the community." It's important to draw a distinction between home care and home healthcare, two different businesses. Home care provides services such as housekeeping, companionship and assis- tance with activities of daily living. Home health is Medicare-certified and pro- vides medical services that might otherwise be delivered in a hospital or nursing home. As such, home healthcare is subject to more rules and regulations than home care. In 2015, the Centers for Medicare & Medicaid Services (CMS) launched a star rating system for home health agencies similar to the one used to rate nursing homes. Some states require home health agencies to obtain a certificate of need (CON), which may be difficult to obtain. Senior living providers say Medicare billing procedures are also an impediment. Both home care and home health are highly competitive businesses. Many agencies provide the services. Franchises such as Home Instead and Comfort Keepers advertise heavily to consumers. Meanwhile, staffing is an ongoing challenge. Worker turnover rates are high. According to the Private Duty Benchmarking Study, the median caregiver turnover rate for the home care industry was 53.2% in 2013. On the plus side Home and home health services do offer senior living providers a way to manage the care of frail seniors as they need additional or specialized services. It's also a way to expand a business. Two years ago, Van Dyk Healthcare launched a home care service, Van Dyk at Home. It does not offer home healthcare. The company owns and operates two skilled nursing facilities and an assisted living and memory care property, all located in New Jer- sey. An adult day center for those with demen- tia is scheduled to open early next year. "So many hospitals are discharging people directly home," says Bob Van Dyk, president and CEO of Van Dyk Healthcare based in Ridgewood, N.J. "We felt we needed to provide home care." This isn't the company's first foray into home care. It jumped into the home care market about 10 years ago, but then abandoned the effort. "It just wasn't the right time," says Van Dyk, who chaired the American Health Care Associa- tion, the industry group that represents nursing homes, from 2009-2011. 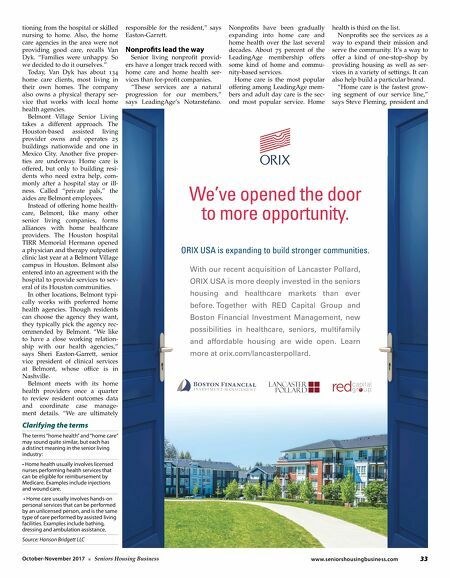 Like other senior living providers, Van Dyk jumped back into home care, in part, as a way to offer a seamless experience for those transi- The Home Care, Home Health Challenge n Operations Senior living providers tackle a low-margin business with a variety of approaches. Home care aides from the Well Spring Group, a retirement community in Greensboro, N.C., help seniors in the wider community rather than just residents in their facility.